O'Qua, Tracker, like the other two of the three cards in this set, adds to the Orothe steal-a-creature abilities. 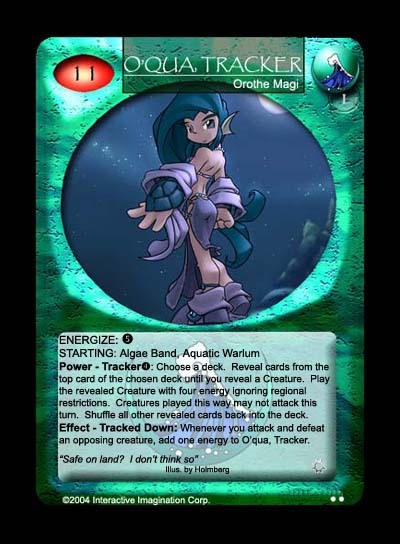 Stealing a creature isn't enough though, she gains energy if she defeats an opposing creature in an attack, something that is entirely very feasible given her abilities to steal creatures or pump up her own creatures with the Algae Band. Her stats are slightly better than the card she replaces, with an additional energy for energize. The flavour text was written by Stephan Classen which aptly describes this new version of her with legs. The artwork is by Matt Holmberg, who was the major artist at Decipher prior to his departure.